Back when G was small we lived in Saddleworth, a collection of villages pretty much atop the Pennines between Manchester and Leeds. It’s a lovely place, but unfortunately the practicality of commuting and getting home in time to pick up children meant we moved to the suburbs. We still love to join in with the Saddleworth traditions though, and there’s none bigger, better, and quite literally brassier than the annual Whit Friday brass band contests. Easily the highest profile event in the Saddleworth calendar, the mornings are taken up by the traditional whit walks to Uppermill, with each group of villagers led by their own brass band. In the afternoons and late into the evening each village puts on their own competition, and bands travel from miles around to compete in as many as they can. 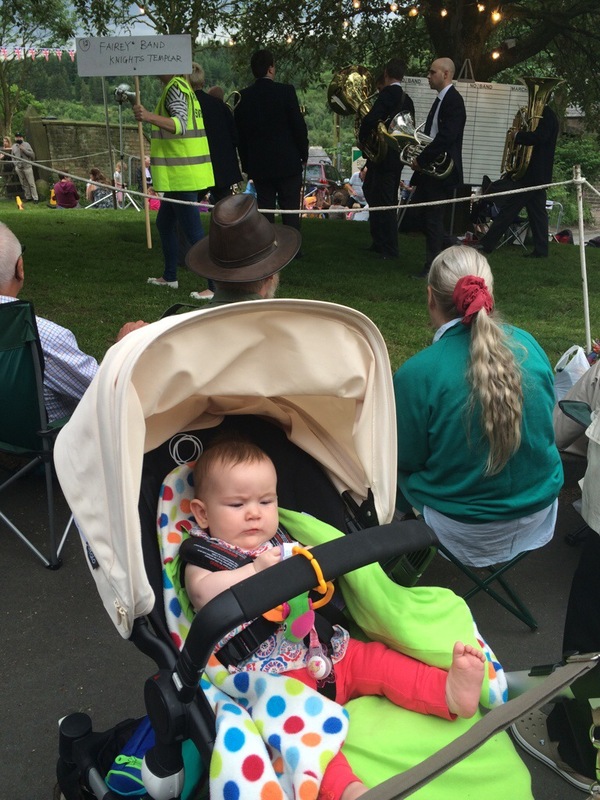 G has been to Whit Friday in Dobcross every year since she was born, and this year was C’s first time experiencing it. As you can see from the picture she was (as per usual) pretty nonplussed by the whole thing, more interested in playing with her toy than watching the rather good Fairey Band walking out behind her (they came second at Dobcross, beaten by Black Dyke who also won the overall contest, and who C also had the pleasure of watching, er, mostly ignoring). C did, however, rather enjoy the picnic we took along with us. Yes, despite my trepidation we’ve started weaning and had no issues so far! Being an old hand at these events, G was straight in to grab a spot on the grass right next to the band, and happily danced, sang, and ate (yep, she enjoyed the picnic too!) through the bands. There’s only so many times you can listen to Knight Templar however – and I fully expect to be shot down by the real brass band enthusiasts for saying that – so we made a move up to the local pub where the bands typically play more modern tunes as they march down from the band club for their turn. Here C took a much needed nap (eating is tiring work, you know), and G dragged first Daddy, and then Mummy up and down the marching stretch to follow each band down in turn. Highlights included Tartan Brass (“Look! They’re from where Daddy’s from! And they wear that thing Daddy wears!”) and perhaps the furthest travelled band, Neo Brass Band from Japan. Heading home with two tired kids in the back, I idly wondered how often we’d be able to keep going to Whit Friday in Saddleworth. And as G headed off to bed she turned and said “can I take my toy trumpet next time?”. Perhaps what I should have been wondering was whether we’ll ever have to swap the civility of sitting on the grass at Dobcross with a picnic for chasing band buses around the villages to cheer on a trumpeting daughter or two?